I am excited to have my Banned Book Trading Card submission selected by the Lawrence Public Library, to be included in this year’s pack. 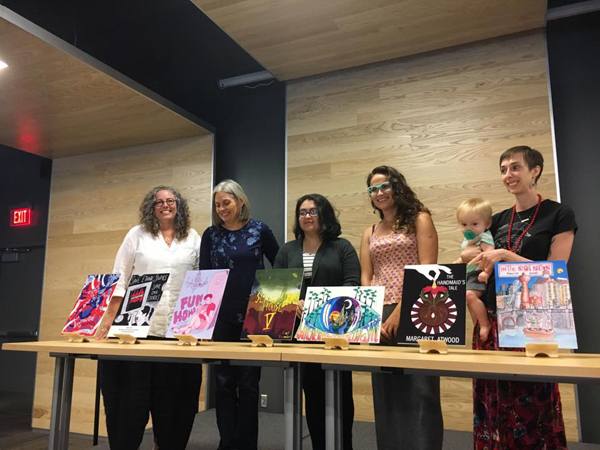 The 2017-pack of cards includes art by Lana Grove, Maya Weslander, Brisa Andrade, Chelsea Karma McKee, Johnna Harrison, and Elijah Jackson. All of the submissions will be on display this week at the library. You can pick up a new trading card every day this week at the library, starting today (Sunday September 24, 2017) through Saturday. My card will go out tomorrow! My banned book submission celebrates Chicano! The History of the Mexican American Civil Rights Movement, by F. Arturo Rosales (Arte Publico Press, 1996). Chicano! is one of seven specific texts that were banned from classrooms in Tucson, Arizona, in 2012. Additional books and teaching materials were also confiscated. The books were banned when the Tucson Unified School District eliminated the Mexican American Studies program in response to a controversial state law meant to curtail ethnic studies programs. The law was widely understood to target the Tucson program. I chose to highlight a book that would draw attention to this egregious case of government censorship. 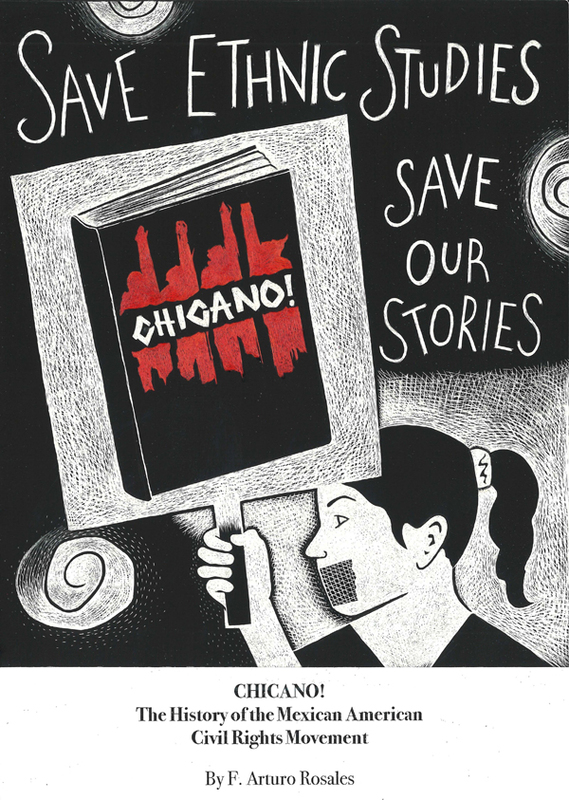 Although Banned Books Week often celebrates novels and well-known classics, scholarly books like Chicano! are sometimes banned, too, and I wanted to show this. I turned the tables a bit with my image, too. Instead of portraying a story that occurs within the book, my image portrays the book itself within the story of its banning. My illustration shows a student protesting the banning of ethnic studies, with the book on her protest sign. Her mouth is taped, a potent image used by students in their protests against the ban. Rosales wrote Chicano! to accompany a four-part television series by the Corporation for Public Broadcasting, which aired the programs in 1996. Both are heralded as providing the most comprehensive account of the Mexican American civil rights movement, a movement whose stories are, as Rosales notes, “practically untold.” It was interesting for me to imagine the elimination of the Mexican American Studies program in Tucson, and the protests over it, as a new chapter in Rosales’s book. Chicano! was pulled from classrooms as a result of Arizona state law HB 2281, which prohibits public and charter school courses that “promote the overthrow of the United States government,” “promote resentment towards a race or class of people,” “are designed primarily for pupils of a particular ethnic group,” or “advocate ethnic solidarity instead of the treatment of pupils as individuals.” An independent audit of Tucson’s Mexican American Studies program found it to be in compliance with the law and recommended its expansion. But the Tucson school district’s superintendent, along with officials from the Arizona Department of Education, decided the program was not in compliance, and the program was cut. The program was in limbo for many years, with some parts reinstated, as a challenge to the law made its way through the courts. I am happy to report that in August of 2017, just last month, a judge found that Tuscon’s Mexican American Studies Program was a victim of ‘racial animus,” and proclaimed the Arizona state law to be unconstitutional.